The jump stop is helpful offensive footwork that can be used at the end of a dribble, or to receive a pass and be in triple threat position. At the end of a speed dribble, young players will often stop, fall forward from their momentum, and get a traveling call. Ending the speed dribble with a jump stop will prevent the traveling violation. The jump stop is executed by the player, who is on the run, taking one small step and then landing on both feet simultaneously in proper balance (not leaning forward). When receiving a pass with a jump stop, either foot can be used as the pivot foot. This is especially helpful for the low post player. There is often confusion on what is or is not traveling and when do you still have a pivot allowable after a jump stop. I have quoted the rules below. My interpretation is this... it depends on whether you already have possession of the ball or not (as in receiving a pass), and whether or not you have already used up the one-step that you are entitled to. When receiving a pass with a jump-stop, you can pivot after the jump-stop and either foot can become the pivot foot. This is especially helpful for post players. A perimeter player can catch the ball with a jump-stop, and the pivot into triple-threat position if necessary and use the non-pivot foot for executing jab-step fakes or a drive step. Now let's take a player who already has possession of the ball on the outside. He/she makes a dribble move into the lane, picks up the dribble, takes one step, and then lands a two-footed jump-stop. So far, so good. But after landing the jump-stop, he/she cannot move either foot and has no pivot foot since the one step was already used up prior to the jump-stop. He/she could jump upward, but must either shoot or pass the ball before either foot touches the floor again. The following is taken from the National Federation of State High Schools web-site in regard to this rule. 1. A player who catches the ball with both feet on the floor may pivot, using either foot. When one foot is lifted, the other is the pivot foot. (1) Simultaneously on both feet, either foot may be the pivot. (2) On one foot followed by the other, the first foot to touch is the pivot. (3) On one foot, the player may jump off that foot and simultaneously land on both. Neither foot can be a pivot in this case. (1) It is the pivot when the other foot touches in a step. (2) The player may jump off that foot and simultaneously land on both. Neither foot can be a pivot in this case. c. The pivot foot may not be lifted, before the ball is released, to start a dribble. b. Neither foot may be lifted, before the ball is released, to start a dribble." Here is a drill for teaching the jump stop. First demonstrate the jump stop to your players. Have all the players lineup on the end-line, with adequate spacing. Start this drill at slow speed initially. Have the players jog down the floor slowly. When you blow your whistle, they come to a jump stop. Yell "go" and they start again. Every-time you blow the whistle, they jump stop. Do this back and forth, up and down the court. When they look like they are getting the hang of it, have them sprint and do the drill. Then give everyone a ball, and dribble slowly down the floor, doing jump stops. Eventually work up to the speed dribble and jump stop. 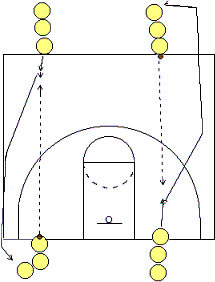 Form two sets of lines, one at an end-line, the other at half court, with the lines facing each other (see diagram A). This drill is good for learning to receive the pass with a jump stop, and is also a good passing and conditioning drill. Passers make good chest passes. Make sure they don't lob these passes. Passes should have "zip", speed. The passer then follows his pass and sprints to the rear of the opposite line. The receivers move toward the ball and receive it with a jump stop, and hold the triple threat position briefly, and then make the pass to the next player in the opposite line, follow the pass, and get into the opposite line. Make sure passes are crisp, and the receivers are coming to the ball and are jump stopping. Check their triple threat position. Players should be sprinting to the opposite line... get a little conditioning in here too. You can also use this drill to teach the one-two step stop. Here is another simple drill for teaching the jump stop and pivoting all at once. Players should pair up together on a side or endline. One player dribbles forward about 10 feet, stops with a two-footed jump stop, and then pivots several times and finally passes back to his/her partner, who repeats this procedure, while the first player returns to the endline.